Wayfinding signs and tools are commonly used to get visitors from Point A to Point B, but why not make more use of this extremely valuable real estate? Beyond helping people not get lost, wayfinding should be inspired by, and more connected to, a community’s brand, giving people a sense of place and reinforcing its unique personality. Don’t get us wrong – wayfinding programs should absolutely prioritize telling people where they are and help them get to where they want to go. We all know what can happen when signage systems fail – we miss flights, we zoom past our exits, we’re late to appointments and spend time irritably pacing up and down streets looking for our destination. But while some believe its sole purpose is to provide directions, we believe that the best wayfinding strategies transcend navigation to instill a stronger sense of place. In this position paper, we dig down into how organizations can support deeper discovery, exploration and engagement by aligning their branding and wayfinding strategies. First, let’s get something straightened out. Just as many people assume a brand is a logo, there are some places that confuse the design of a new wayfinding system as being their brand. Yes, the two disciplines are connected, but they are not one and the same. Your brand is the summation of everything that makes your organization what it is and differentiates you from your competition. It’s your story, your people, your culture, your visual identity and your messaging. For example, a university’s brand answers the question, “Why should I choose you?” When students decide to visit campus, they expect a certain experience based on everything you’ve communicated thus far. Upon their arrival, any uncertainty about where they are or difficulties in finding parking, key facilities and nearby accommodations will make them question not only their decision, but also your brand. This is exactly where wayfinding comes into play. Wayfinding connects various verbal and visual elements of a physical environment, including space, maps, directions, architecture, landscape design, symbols, colors and logos, to remove ambiguity from the DURING stage of the User Continuum. When visitors are happy and well-oriented, they are likely to spend more money, plan return visits and sing your praises to their family and friends, which in turn, boosts the overall brand experience. While directional messaging and symbols are always going to be important, especially when visitors arrive and exit, connecting the brand to a wayfinding system provides an added level of benefits and purpose to otherwise generic signage. In addition to its basic functionality, branded wayfinding can introduce personality, storytelling and opportunities to capture the moment, contributing to deeper relationships between the place and its audiences. Whenever we kick off a new project, we always start with the brand. We love digging into our client’s historical, physical, cultural and social features to see how we can incorporate materiality and context to express the uniqueness of a place. A Case in Point: Initially, City of Kent leaders engaged Guide Studio to help them get visitors from the city’s parking lots and garages to various downtown hot spots more easily. It was a practical goal, but they needed to do more to engage people in everything the city had to offer. 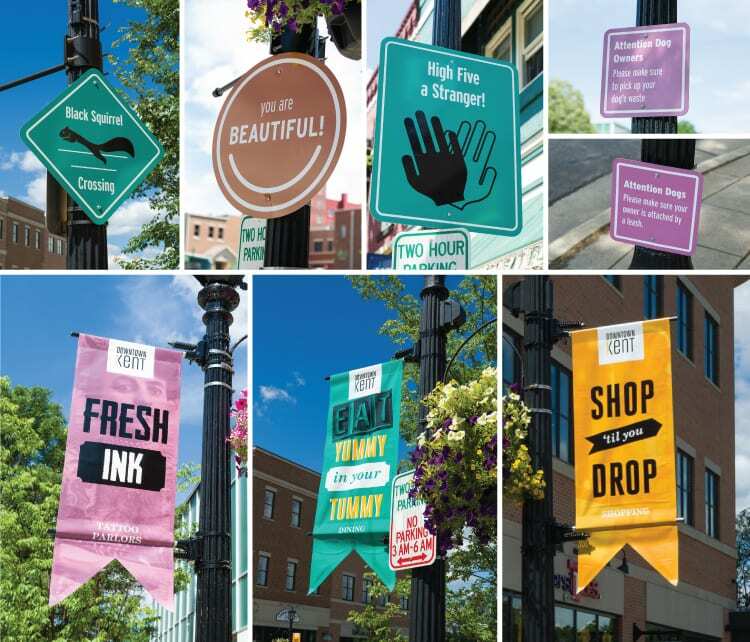 Whether you’re looking to create a new wayfinding system like City of Kent or update the existing one you have in place, it’s critical for your brand to be fully developed before you get started. If you’re ready to brand your wayfinding, think beyond adding your logo and colors to your signs. Take a more holistic approach by considering all of the critical touch points throughout your environment, including your gateway signs, crosswalks, tour guides, information desk, vehicles, seating areas and more. Even trash cans, the backs of signs, uniforms, light poles, windows and doors, etc. should be fair game. How can you enhance these elements to support a more brand-aligned experience? 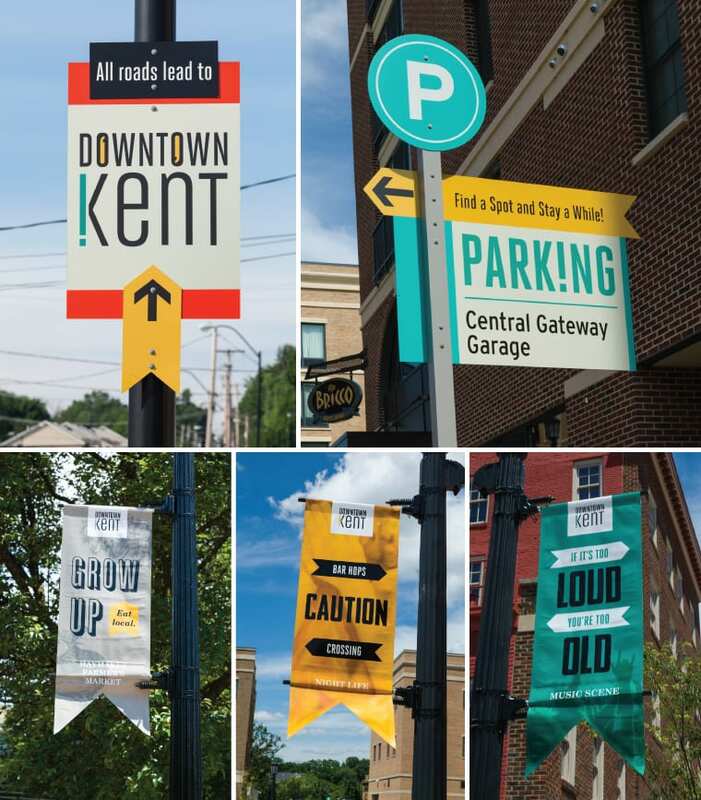 Beyond infusing some humor and quirkiness into their signs, City of Kent wanted to honor the town’s history through their wayfinding system. They worked with the Kent Historical Society to put together stories that were placed on the backs of pedestrian kiosks. Is your organization ready to step up to the plate? We live in an age when people have become highly sensitive to user experience. Websites and mobile applications have introduced us to sophisticated navigation, layouts and imagery, making us all self-proclaimed design aficionados. As a result, our expectations for our physical environments are even more heightened, leaving little room for sub-par design and poor navigational support. While that may sound a little intimidating, keep in mind that the synthesis of your brand and wayfinding should be a creative exercise of just being yourself. Not only is that one of life’s most important lessons, but places can, and should, reflect the history, people, aesthetics, stories and personality for which they are known. What’s the fun in looking like everyone else when you can stand out from the crowd. Giving visitors the opportunity to get to know the real, authentic side of your place will make them appreciate you even more. What’s your story? We’d love to hear it.